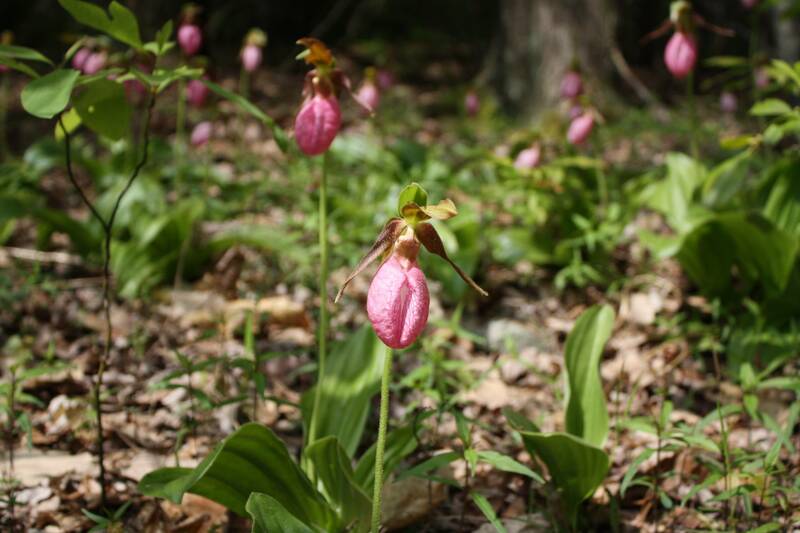 Since I mentioned lady’s slippers recently, I am posting a photo of some pink lady’s slippers that I took a few days ago. The other kind of berries we picked were buckberries. We had such an abundance of buckberries right there at Quebec there was no need to go anywhere else for them. Grandma’s house was right at the foot of Tom Lyman Mountain. Tom Lyman Galloway was brother to my great grandma Parilee McCall. By that time he was dead, so I never knew him, nor did he ever have a home on the mountain that bore his name. We’d leave out after breakfast and go up on Tom Lyman’s mountain, carrying several peck buckets, which we quickly filled with buckberries. By dinnertime (somewhere between 12:00 and 1:00 p.m.) the buckets would be running over and we’d be on our way home. Both berries are good eating, having a bit of a tart taste, but the buckberry is simply delicious. Its texture is similar to that of a blueberry, but the flavor is far superior, spicy and sweet-tart. Buckberries are shiny black at maturity and about the size of cultivated blueberries. They are a little larger than wild blueberries in areas where the soil is rich. The leaves of the two plants differ somewhat, but not much. The easiest way to tell them apart is by the color of the fruit. Also, if you will notice, the ripe blueberry has a little frill on the end; the buckberry has a little circle, but no frill. The photo of the ripe berries was taken by Graham Sexton. I have lost my source information; I think it came from Wikimedia Commons and is licensed for re-use, but I could not find it in a recent search of that site. My apologies, Mr. Sexton, if I am infringing. The other photos were taken here at our place at Toxaway. 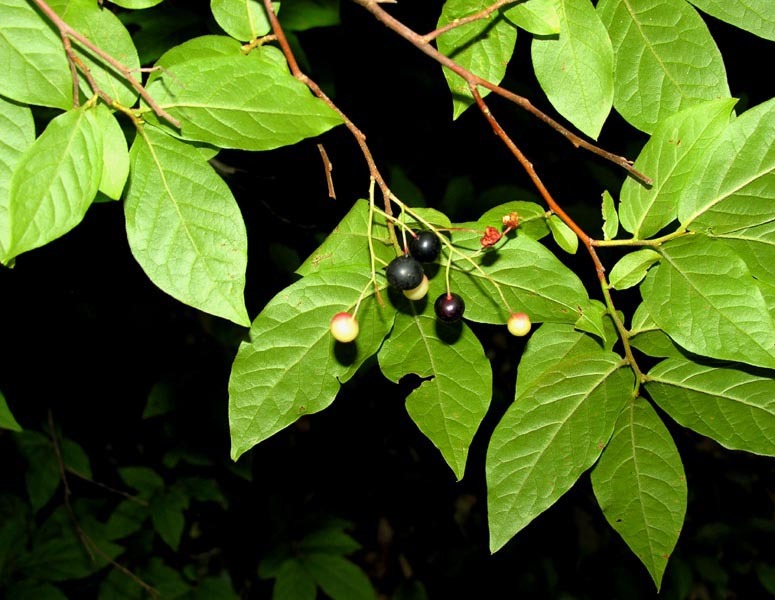 The buckberry is also known as the bear huckleberry. Its distribution is limited to the southern Appalachians, namely North Carolina, South Carolina, Georgia, Tennessee, and maybe Virginia. 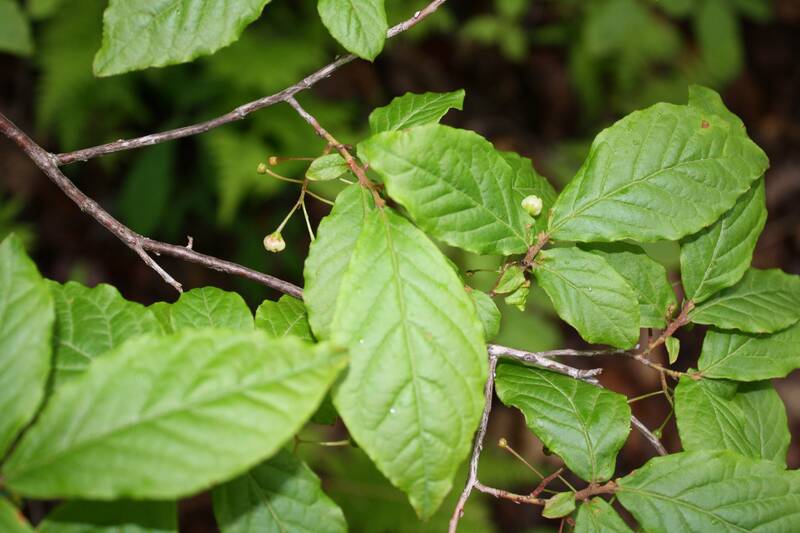 Buckberries grow as understory plants in the forests of these areas. Where they get a fair amount of sunshine, they produce well. However in our area, most of the timber has been allowed to mature and the shade has discouraged the production of berries. The bushes are plentiful, but nowadays berries are few and far between. Which is a shame. Not even a wild strawberry can compete with the buckberry for flavor! I have been trying to find a name of the understory brush with red to black berries. They match your description exactly. They are Buckberries. We live part time in Sapphire Valley. Great article. I have buckberry bushes along shore of Lake Glenville. As most plants are heavily shaded they seldom produce, some have had small green berries in the past, so I never tried to pick or taste them. This year many bushes which are on edge of woods (get some sun) have large crop of berries. Now (mid-September) only a few have dark red to purple colored berries. More are full of green berries which appear to be ripe, because many are dropping off the bushes similar to those dropping off the bushes with purple berries. Knowing little about these berries, I wonder if there are two (or more) buckberry varieties? The taste of the dark berry is tart and flavorful, whereas the taste of the green berry is slightly sweet with mild berry flavor. I’d love to pick and use these berries, but want to be sure they’re safe for consumption first. I’d be glad to email some pictures, if that would help.